Description: Restrictions apply on 30 shot magazines for some jurisdictions, so please read this ad carefully before offering to buy. This listing is for THREE Magazines with free shipping. Add any of our other non gun, non ammo items and shipping is free for the entire order. Lower 48 Only. Here are some of the best Kalashnikov magazines in the world, for the AK47 series rifles chambered in 7.62x39 caliber. Manufacturer is KCI, Kyungchang Industry Corp., Paju City, Republic of Korea – South Korea. KCI is a 30 year old company, and the premiere military industry manufacturer in all of Asia. We have sold their magazines now for 10 years with no kick back. Construction is entirely steel – including the cartridge follower – with ribbed sides and 13 rear spot welds and 7 front side for strength and durability. Feed area is two ply lateral with 4 welds each side; and 5 weld front. Locking lug is 6 weld two ply. Finish is PTFE Teflon base coating, semi gloss black. Each magazine holds 30 rounds of 7.62x39 caliber ammunition. 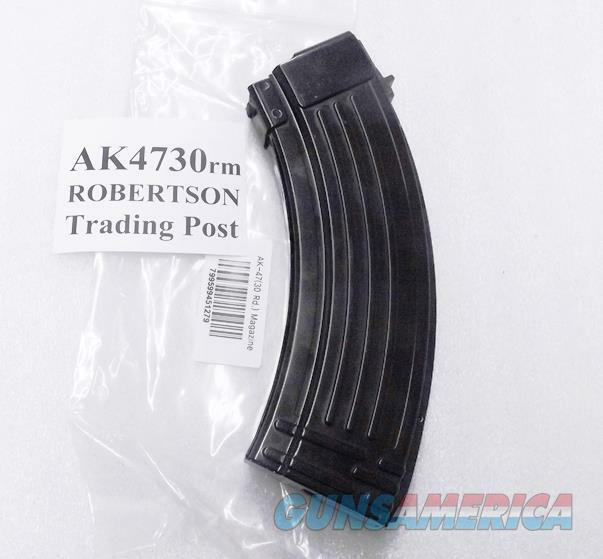 These magazines will fit most any AK47 type rifle or pistol. They will not fit a CZ2008 or its variants. They will not fit an SKS rifle. They will not fit a Ruger Mini 30. They will not fit the nozzle of a 1958 Rubbermaid hot water bottle. They will only fit AK47 type rifles and pistols like the Zastava M70, Century Arms’s WASR series, Chinese AKS rifles and similar, that accept standard Kalashnikov double stacked magazines. Replacement pricing on these has recently been as high as $50 apiece. We’re offering them 3 at a time, however, at only $14 per freight paid lower 48. Own 3 for only $42.00. Not for sale to civilian residents of Aurora IL, California, Chicago Cook County IL, Colorado, Connecticut, District of Colombia, Hawaii, Maryland, Massachusetts, New Jersey, New York, Vermont, or any jurisdictions where 30 shot magazines are restricted to law enforcement only. Any ammunition, firearms, or personnel showing in any of our photos are NOT included.